Breton Conjurer is an epic Intelligence creature card. It is part of the Core Set. 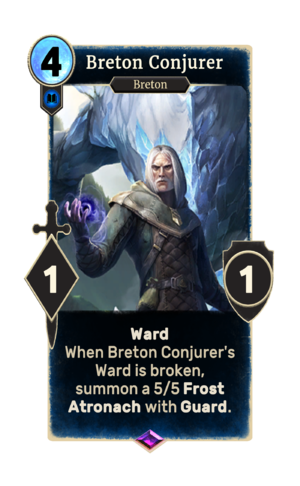 In addition to the card's availability in the Core Set, one copy is obtainable in the Dunmer Avengers deck as a reward from Tangled Web. "The elements are mine to control!" "My friend would like a word with them." This page was last modified on 14 February 2019, at 00:27.